A powerful young love story set in the bleak badlands of a ruined civilization. When I was a young kid I remember asking my parents, “Why do the lights come on when you flick the switch?” I also wondered about how cars worked, how sidewalks were made, how clocks kept time, and about thousands of other things that little kids see all around them. I never received a satisfactory answer. My parents usually told me that I should ask some workman or scientist because in truth they didn’t know. As I grew older I put such questions on the back burner of my mind when I realized that I would never really understand at least 99% of the things in my life. 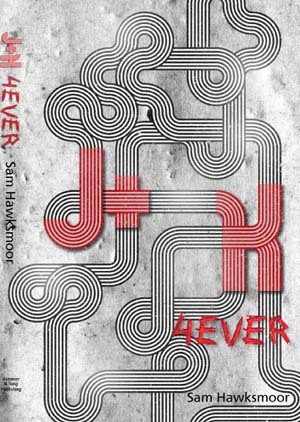 Sam Hawksmoor in this novel J&K 4EVER creates a world in which people have lost the accumulated knowledge of civilization. People understand little of what had once been civilization. In its place, a perfect storm of man-made and natural disasters have created a dystopia. Jeyna and Kruge, two young orphans in love, struggle to escape this horror. The book tells their story. Hawksmoor's descriptive skills take over from the very first page. One scene particularly left me stunned. On their escape from Bluette, whose officials try to capture, torture and likely murder the two “escapees,” the lovers meet a young woman bound up in a type of straight-jacket. She is at “the dentist.” As he pulls out each tooth, blood gushes out of her mouth in torrents. While it looks like torture, the woman is actually happy about the extraction. She wants to be as healthy a bride as possible for her new husband. Wound up in this dystopia the two lovers create a heart-warming story which testifies to the ultimate strength of youth. The couple overcomes all the obstacles that corrupt society places in their way. The novel J&K4EVER testifies to the triumphal power of friends, family and goodness in light of darkness. It is a novel which I thoroughly enjoyed and highly recommend. Once you start reading you will find it hard to put the book down. It was not that he simply missed her. She was right in front of him. He felt diminished. It was as if he suddenly wanted to go out to Burger King for a 2 for $4 breakfast and the seat next to him was empty. Her head travelled horizontally back and forth trying to get its bearings--restless wheat in a breeze. The Basilica of Nuestra Senora del Pillar lay in front of her, big as a football field.